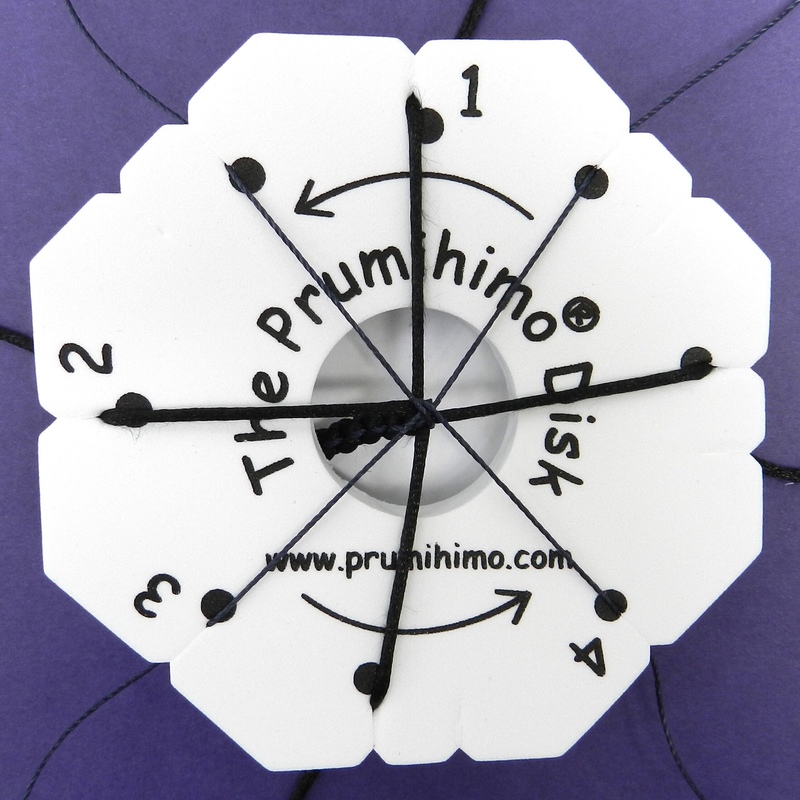 The Prumihimo Disk is sold with instructions, but here is a reminder in case yours are not to hand. Please remember that the design of the disk is protected by pending design patents/design protection and these instructions and images are protected by standard copyright laws! Hold the disk so that number one is at the top. Move the cord from the top slot to the empty slot on the bottom. Move the cord from the bottom slot with a dot up to the top slot. Move the cord from the unmarked bottom slot across to the bottom slot with a dot. The cords are now back in the home positions. All the cords should be in slots with dots. Follow the arrow so that number 2 is at the top. Repeat the moves. Top Down –Bottom Up – Bottom Across. All the cords should be in slots with dots. Follow the arrow so that number 3 is at the top. Repeat the moves. Top Down –Bottom Up – Bottom Across. All the cords should be in slots with dots. Follow the arrow so that number 4 is at the top. Repeat the moves. Top Down –Bottom Up – Bottom Across. All the cords should be in slots with dots. This completes the sequence of moves. Follow the arrow so that number 1 is back at the top. Repeat the moves at numbers 1, 2, 3 and 4 until the braid is long enough. Make sure that all three moves are carried out at each number and that the cords are in slots with dots before turning the disk. Other wise the braid will be kinked and twisted. Click here to see a quick video of the disk in action!